Disclaimer: Not responsible for any mishaps, such as sudden explosion, fires, death ,or any malfunctions broken parts that happen to your car!!! NOTE: NO OPEN FIRE/FLAMES OR SMOKING IN OR AROUND CAR WHILE DOING THIS MAINT.!!!! DO IN A WELL VENTILATED AREA!!!!! Parts youll want to buy from the dealership. A few facts: As a rule, a fuel filter should be changed at 30,000 miles. But i ran almost 88000 miles on mine. A way you can tell, once youve pulled the fuel filter, if its dirty is by blowing through it, youll feel resistance to air flow if dirty. 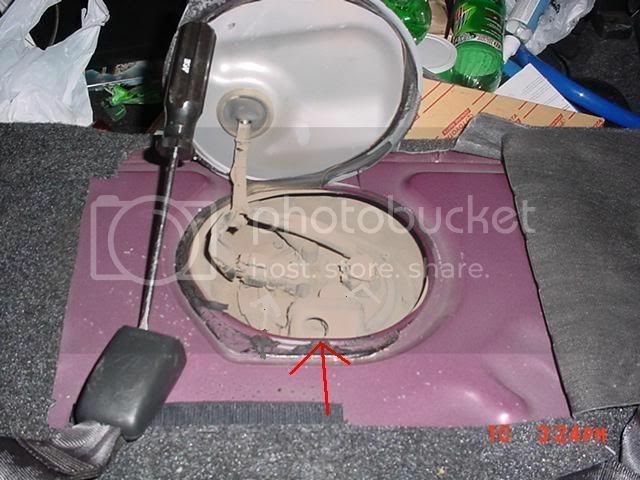 But on the Scion xB, i think once youve gotten the filter out...you dont care, your gonna change it!! Allrighty then, lets get started!!! You gonna have to pull the back seats. Their easy to remove, your gonna have to remove the storage comp. and spare tire and foam. After thats removed, look for 3 bolts on the floor connecting the seat, And one in the front, just lift on the front of the seat, 2 snap type connects hold it down. Theres a bolt to the front of the bar the the 3 back bolts are conencted to, remove it. On the lower end of each corner of the backrest, youll find on the back a bracket bolted to the backrest, unbolt each, the seat should remove, its quite heavy for its size!!! NOW the seats removed....to the fuel filter. 1. Youll see the square cut out in the carpet, lift it up, theres velcro on one side. Lift it. Once its lifted up, youll notice a black peice of rubber, remove it, keep it, it protects the wire harness. 2. Take a flathead screw driver and find the tab to the drives side bottom of the cover. 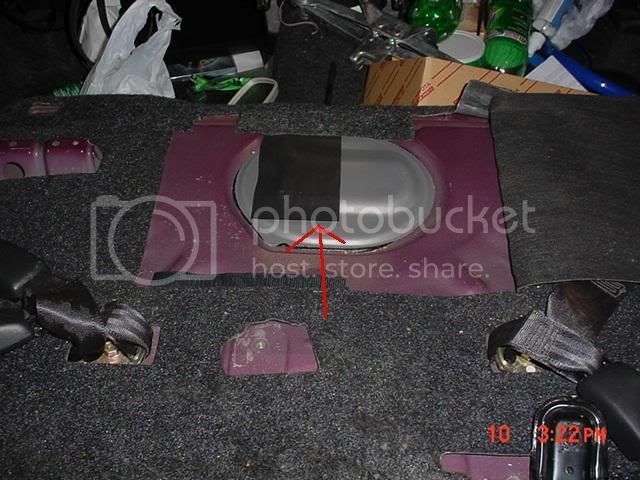 Take the flathead and pry on that spot, if you dont, youll bend the metal cover, not a real big deal. Once lifted, try to keep from getting dirt on the black tacky type glue used to hold it down, and do not remove it!!!! At this time, remove the 2 wire harnesses. The one with the double arrows(in the picture below) is a little pain, I had to push pretty hard, I heard a click and it popped right off. Once you have the harnesses unclipped, set them to the side with the cover. 3. Now take this time to clean around the cover, this way you dont knock any loose dirt into your tank. Also, pop your hood, and start your engine and let it stall, you just relieived the fuel pressure. Also, remove the Neg. battery terminal. Look for the fuel line too. Youll have to remove clamp cover, just push down. For saftey purposes, hold a towl under the connection, fuel will squirt out!!! Squeeze the 2 gray tabs, and pull, itll slide off. 4. To the rear of the car again. Look for the line with the yellow clamp, youll have to remove it, do not throw away, youll need it when reinstalling!!. yet again, have a towl ready for any fuel that may be in the lines. I didnt get a good pic, so i fixed this one to help show where to look. 5. 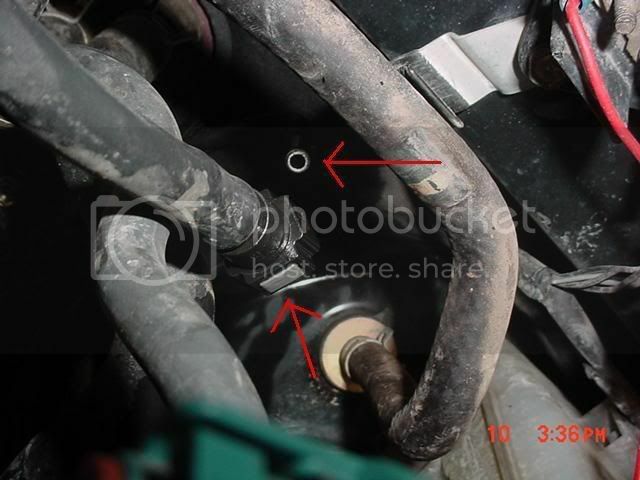 Youll also want to remove a bracket over the other fuel line, 2 bolts and its removed, bad pic, but you get the point. 6. Remove both lines, the one that had the clip, pulls right off. the other line, push in on, push the 2 tabs in, and pull, should slide off. Put each line in a bag to prevent and dirt getting in them. 7. Go ahead and remove the rest of the bolts on top. Set them to the side. Have a oil catch can to the side. 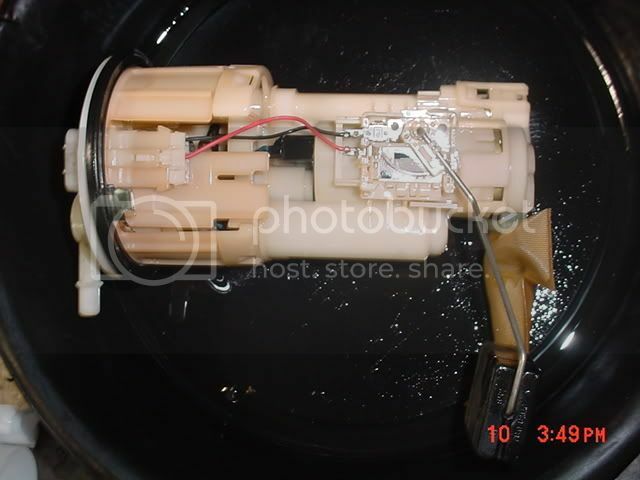 Start to pull the pump/filter assembly out, but be careful, and watch for the float and pump sock. When you remove it, place it in the oil catch can to prevent getting fuel in your car. 8. Your gonna want to remove the float from the sender board next. Push down slightly, and slide it out from the other 2 tab its locked under, you can see the 2 tabs in the pic, the arrow points to the tab you push down on. sorry for the bad quality picture!! 10. Time to take the level sender off. Push down on the tab(arrow in the pic) and push the level sender board down. 11. 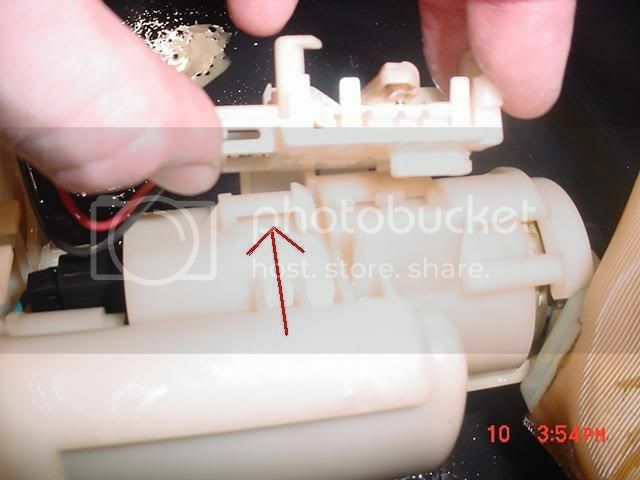 Remove the cover from the bottom of the filter assembly, push on the 3 tabs the arrow points to. After they are unclipped the other side will be easy...NOTE: these 3 tabs will provide it easier to remove the cover. 12. Remove the rubber cap...nuff said. 14. 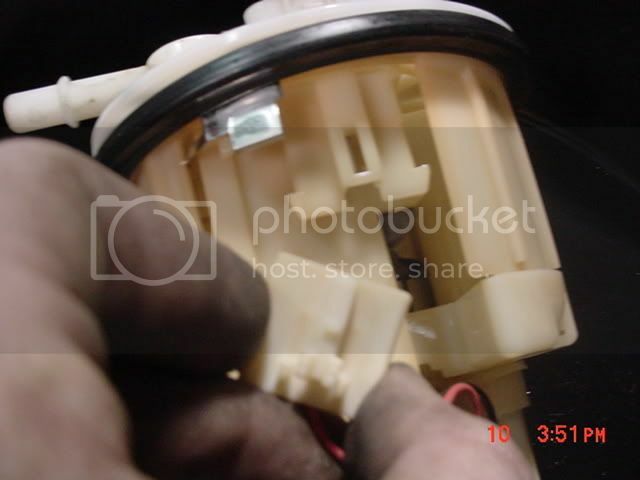 Your gonna want to remove the connector to the fuel pump, its on the top of the pump, it pushes out easliy. at this same time, remove the pump sock, a tiny round clip holds it on, youll use the new one here. 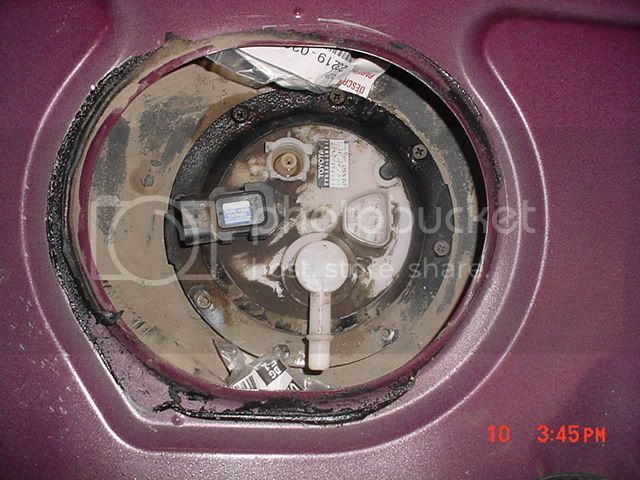 Pull the pump out....you may have to take a screw driver on the top of the motor and push it out, its in tight. Youll want to remove the fuel pressure reg. Its in tight to. 15. Your gonna want to separate the suction plate and filter assembly now, use a flat head to disconnenct the clips, its a bit difficult. When its separated, look on the top of the new filter assembly, next to the black......round thing, make sure you put the O-ring in there, otherwise youll get no pressure!! 16. Putting it together, reverse the steps. A few important ending tips. When its ALL installed, make sure you connect the fuel line in the engine compartment!! Connect the battery. OK thats done, put the keys in the ignition, but dont start but turn to (ON), you want to build fuel pressure first, so wait a few minutes. should start after a few tries if done correctly. Hope this helps anyone that wants to do this maint on their car and not go to the dealership. Good luck!!! this should be with the tech articles!!! Awesome write up. When should we look to replace the fuel filter? 50k miles? Great job on the writeup. This has been added to the tech section. thanks!!! I added the prices and milage changing. ill make sure the prices are right tonight. just to let you know, under nornmal coditions a sock filter never needs changing. It just cost a total of $53 dollars for parts from my local Toyota Dealer. Had to be ordered too. I just used this write-up today. Thank you! I bought my xA with 103,000 miles on it and had no record of it ever having a fuel filter changed, so I decided it was time to do it myself (at 108,00 miles). 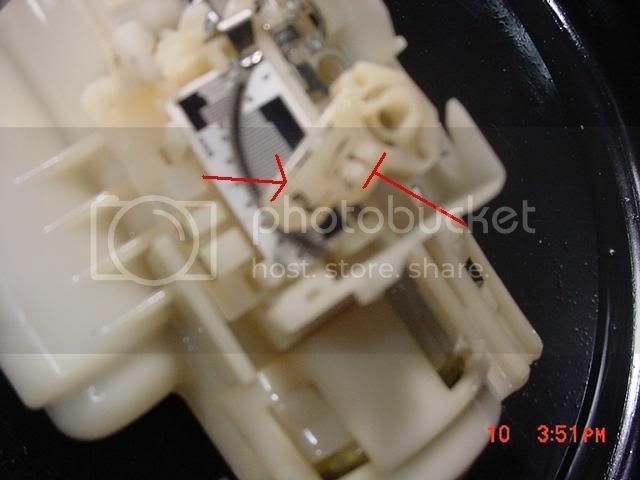 Sorry I didn't take any pictures, but FYI the spot that rubbed through was right at he "Y" of the wiring harness. thanks, very concise , used this in changing my fuel filter last night and all i did was to follow it step by step. saved me a lot of time. Last edited by archebald23; 07-13-2010 at 02:10 AM. Just fyi - an easier way to relieve fuel pressure - disconnect the fuel pump electrical connections than start the car - the car may run for a sec or two - basically its discharging what pressure is left through the injectors. Much less messy and time consuming as disconnecting the line under the hood. 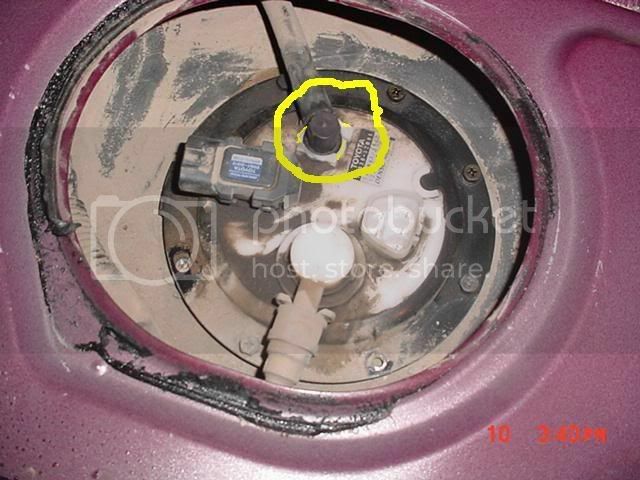 To relieve pressure, can you just remove the fuel pump fuse? and then start the car. I took may car to my mechanic and told him I wanted the fuel filter replaced. He called back and said the car didn't have a replaceable filter. I thought that was strange because I had already read this entire thread. So I asked a few more questions. He said they even called several parts stores and they don't sell a replacement filter. So I called the local Scion dealership. The parts guy said pretty much all newer fuel injected Toyotas are the same: there is no scheduled replacement for the fuel filter and they don't get replaced unless they get clogged. I then asked him if they ever get clogged and he said it happens occasionally, but it is rare. He didn't say this, but after the conversation, I started thinking that because the filter doesn't clog very often, if it does, they probably replace the entire fuel pump. So I called the local O'reilly Auto Parts and found the whole pump runs $134 and that includes a new sock. I then asked him about the fuel filter and he said one wasn't listed. He went on to explain that this is common on newer fuel injected cars. The filters just don't clog very often and, when the do, most people just replace the whole fuel pump. Btw, if you do need to access the fuel pump, you can remove the seat bottom w/o removing the backrests. You just pull up on the front of the seat and it unsnaps from the holders. Then everything is loose except the rear center portion. You can look and/or feel down there to get an idea of what is preventing you from taking the seat out. You then put your knee against the center portion of the front of the seat and push back hard while pulling up the whole seat. It will come loose once it clears the bracket. You can also cheat and just bend the bracket up using a slim breaker bar, but then you'll need to bend it back down again when putting the seat back in place. Last edited by bearsnob; 07-23-2012 at 06:09 PM. Now it makes sense. I was looking at the instructions and noticed that was an awful lot of work to replace a filter. BTW, Looks like you take the seat out just like you did in American cars from the early 60's. Specifically, my 1963 Rambler, right down to your "knee" instructions. Want to start off by saying great original thread and discussion. This was my first intro to SL. I have an '05 xB that has been having intermittent, delayed starting issues. Specifically: engine will turn over couple times before it starts, but always starts on first try. Brought to independent shop who diagnosed issue as loss of fuel pressure. Fuel pressure in spec (44-50 psi) immediately after starting and turning off vehicle. However pressure drops 10 psi after sitting 30+ minutes. Recommended fix is replacement of fuel pump @ a tune of $630 ($100 labor, $530 parts). Shop obviously marks up its parts and will not perform repair on vehicle if I order parts myself. I don't trust local Toyota/Scion dealer, so I will attempt repair myself. 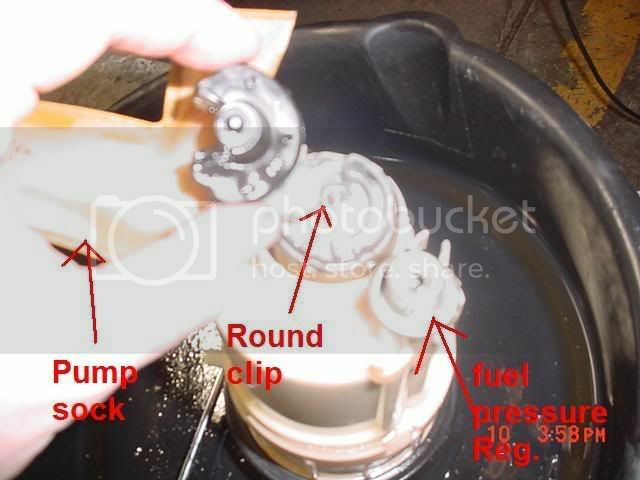 Did some research using xB repair manual on this site and noticed that there is a fuel pressure regulator attached to the pump/filter assembly. Given that my xB's issue is inability to maintain fuel pressure once it's turned off, I figure that the pressure regulating valve is not closing and letting fuel back into the tank. I am inclined to replace the valve myself using instructions in this thread. 1) Is it recommended I replace the entire fuel pump/filter assembly while i'm down there? Seems like overkill when pressure is my main issue. BTW, once car is underway, pressure is fine. 2) Should I purchase OEM parts or aftermarket. If aftermarket, what brands do you recommend? hope this helps any of you! 1. When there is a misfire, it can potentially not only cause your check engine light to engage, but also the VSC and Trac Off lights as well. 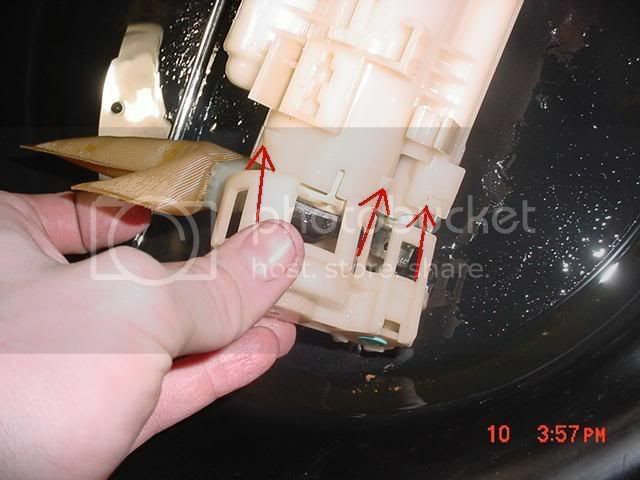 An easy way to identify which cylinder is the problem, is to remove the engine cover, then 1 by 1 disconnect and reconnect each ignition coil. there should be a significant change to your idle if the cylinder is working fine, but NO CHANGE if the cylinder is malfunctioning. Check your spark plugs, but more often than not, it's your ignition coil. Diagnostic Note: A significant power loss and sluggish performance, as well as sounding like a damn Subaru out of nowhere (like a deep fart into a coffee container). 2. Removing of or just a faulty catalytic converter will bring up these 3 lights as well. Diagnostic note: Faulty catalytic will cause sluggish performance, and significant change in fuel economy. Removed catalytic will decrease back pressure, resulting in slower take off, but faster speed increase after 60mph. 3. A loose spark plug can ALSO cause these 3 lights to engage. Diagnostic note: A loose spark plug will cause a misfire, but not always cause sluggish performance. Usually, after the car has warmed up and heat expansion occurs, that's when sluggish performance is felt.